After the Superstar reluctantly signed to face Igor on the June 8, 1977 Mid-Atlantic Championship Wrestling TV show, the tag team bouts involving Igor and Superstar morphed into mainly singles confrontations between the two. One reason for this was that Kim Duk, Superstar’s primary partner, shifted down to mid-card status. The last match involving Duk and Superstar teaming against Igor was on June 24, 1977 in Charleston, South Carolina, where Igor and Bobo Brazil defeated Duk and Superstar. 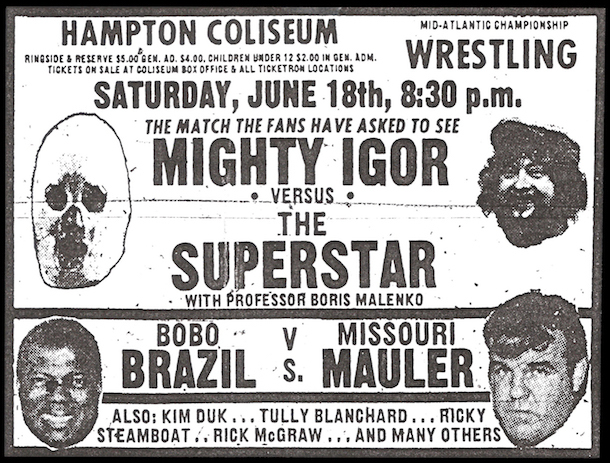 A wild singles match between Igor and Superstar in June occurred on June 18, 1977 in Hampton, Virginia, where Igor tore Superstar’s mask off! Much like the match on TV where Superstar lost his hood, Superstar was able to obscure his face before anybody could identify him. Greenville, South Carolina and Raleigh, North Carolina also saw ferocious bouts between these two during the end of the month of June. In each of these bloody encounters, Igor had his hand raised in disqualification victories. As the calendar flipped to July, noteworthy tag team matches pitting Igor and Superstar on opposing sides occurred, with none other than the “Eighth Wonder of the World” Andre the Giant teaming with Igor! On July 3, 1977 in Greensboro, North Carolina, Andre and Igor teamed up to defeat the burly duo of the Superstar and Blackjack Mulligan. On July 7th (7/7/77! ), Igor and Andre again joined forces to subdue the tandem of the Superstar and the Missouri Mauler in Colonial Heights, Virginia. After the Giant left the area, Superstar and Igor had an even-steven month of July, with the bouts between these two bitter adversaries being highly competitive. On July 5th, the Superstar gained a hard fought count out victory over Igor in Lynchburg, Virginia. However, almost immediately the Polish strongman turned the tables, defeating the Superstar by count out in Hampton, in a wild melee where Wahoo McDaniel tried to keep order as special referee. The last noteworthy tag team bouts that featured Igor and Superstar occurred in mid July in two Texas Tornado matches, where all four men were in the ring at the same time. Somewhat predictably, these two high-energy contests saw a split decision in the results. On July 13th in Roxboro, North Carolina, Igor and Ricky Steamboat combined to vanquish Superstar and Ric Flair. But on July 16th in Spartanburg, South Carolina, the Superstar got back in the win column, teaming with the Missouri Mauler to defeat Igor and Dino Bravo. By the end of July with the result of their feud hanging in the balance, Igor and Superstar entered a new and dangerous phase of their bitter rivalry - - Professor Malenko was pushing for a chain match! Will the Professor have his demands met for a chain match? How will this brutal match affect the heated rivalry between Superstar and Igor? The final chapter, PART 5!